Vuselela Energy with its project Eternity Power Thermal Harvesting™ has won its fourth award, the Renewable Energy Research Excellence Commercial Application Award. 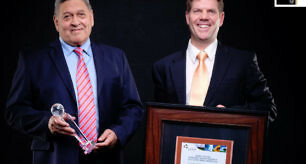 The award recognises the novel technology Eternity Power uses to generate electricity from geothermal heat and is sponsored by RECORD – the Renewable Energy Centre of Research and Development. The South African National Energy Association (SANEA) hosted the awards at a gala ceremony in Johannesburg, 16th September 2016.